The Western Union Tool Car project has made significant progress this year with many items now complete on the car. The siding installation and painting were finished during the summer. The Provision Room shelves and the ice box front were installed. The side doors were rebuilt and reinstalled. The electric generator was painted and reinstalled. All in all, 2018 has been a very productive year. Remaining for 2019 will be the installation of the single diaphragm, preparation of the interpretive signs, completion of the underbody painting, brake work, lettering on the car, and repair of a set of stairs for use with this car. The tool car was built in 1929 by the Western Union Company at their Chattanooga, TN shops. The Western Union Company constructed or modified railroad cars for use in their “camp car outfits” from about 1914 until 1930 for a heavy reconstruction program of their telegraph lines nationwide. until September of 1963 when it was finally disbanded, as well. A rich history full of historical anecdotes accompanies the camp cars. One such story tells of the assignment for many years of a husband and wife cooking team who would operate the kitchen for the outfit. The homey feeling was well received by the line gang members who lived in the cars. Western Union retained some tool and material cars for company storage of materials nationwide as the camp car outfits were disbanded. These cars would be parked in railroad yards for access by Western Union personnel from their trucks in the 1950s and 1960s. The Museum’s car #3558 was last parked at the Atlanta repair office for the Company when it was acquired by the Atlanta Chapter, NRHS, in 1966. A typical outfit consisted of a tool car, two former Pullman cars rebuilt as living quarters, and a material car similar in appearance to the tool car. The tool and material cars typically had only one diaphragm to connect it with the other three cars of the outfit. The other end was blind. A tank car with water was included with the outfit where local water resources were hard to find. SRM’s tool car #3558 is the last car in existence destined to remain in Western Union paint. The tool car housed the Provision Room with saw-tooth adjustable shelves and a Seeger Ice Box Refrigerator. The Kitchen for the camp car outfit would have been in the next car in the outfit. The two were easily accessible through the end doors and diaphragm passageway between the two cars. The Tool Car also housed the Delco electric generator and glass batteries. These provided the electric lights for the entire outfit. The significance of tool car #3558 comes from being a tangible link to a bygone time when the railroads were used to assist the communication industry of the era. The Western Union Company is still in existence today providing money transfer services. 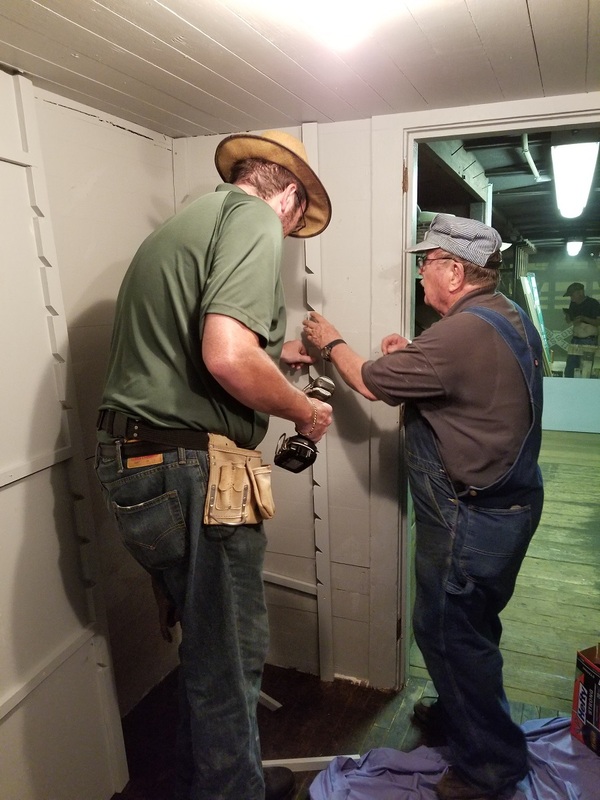 Funding for the restoration has come from two NRHS Rail Heritage Grants plus funds from Southeastern Railway Museum and Atlanta Chapter, NRHS sources.